I just picked up a nice 1959 Glasspar Delmar for a great price and it was only 2 miles from my house! It's pretty original but I'd like to connect with someone who has a similar one, restored or original so I can figure out a few mysteries. My first concern is that I hear water sloshing around in the hull but it's not coming out of the transom drains and I can't see it. Is there an inner sealed hull - perhaps a flotation chamber that the water could be trapped in? Second thing is that all of my seats are missing- what did they look like? Also, the fly bridge windshield doesn't look quite right as it doesn't seem to connect to the aluminum mounting brackets on each end. And there is no cap over the top of the transom, just bare plywood showing. What is missing there? Then there is the cabin (split) doors that have a slide bolt but no handles. Did the original have handles as it is really hard to close the doors without them? And does anyone know the reason for the funny looking bow "hood scoop" that doesn't seem to have any function? I think 1959 might have been the only year for this. In my opinion, this is one of the best looking cuddy's ever made and I'm looking forward to getting it functional again. I would love to see photos of others. 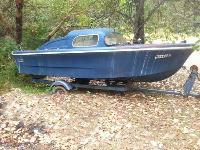 I have a '57 Del Mar but it too has no seats. All the stringers have rotted but you can see the fiberglass strips that capped them. I think there were channels through the stringers so water could migrate to the middle where the drain is. Probably blocked. 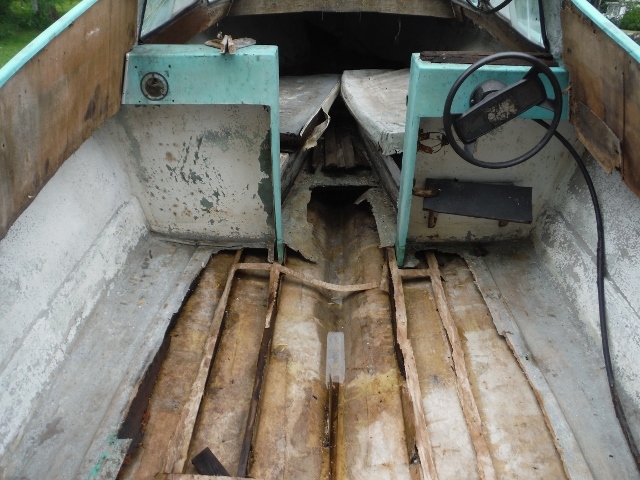 I would cut about a 2' X 4' panel in front of the transom and see what's happening below the deck. 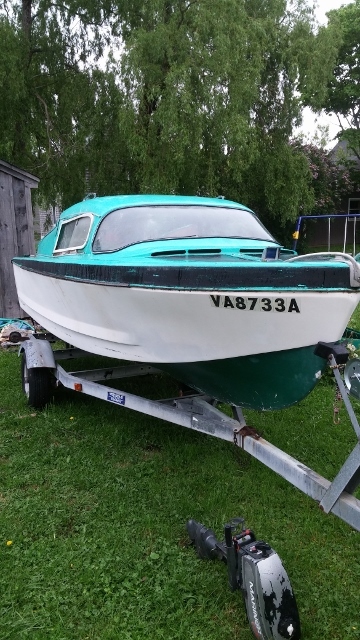 Haven't looked at my boat in about 3 years (next years project) but now I'm curious now, so I'll go look at it this afternoon and see if I can find more info.